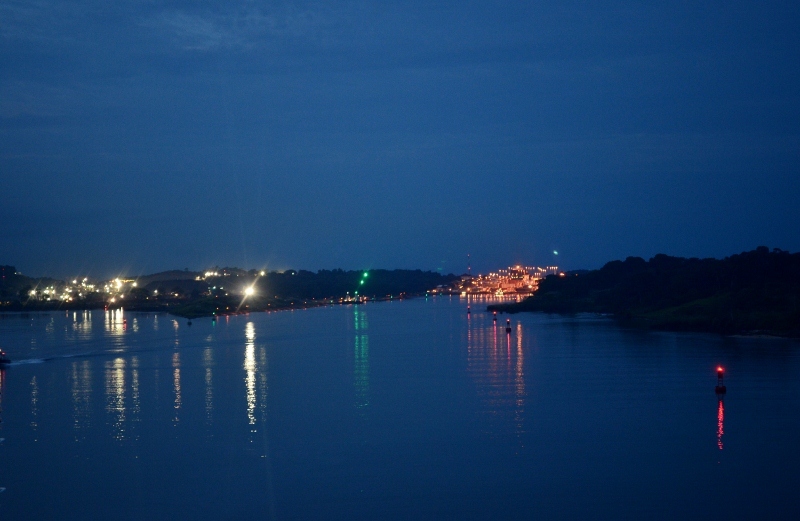 This morning we were awake early and saw many vessels at anchor, waiting for passage through the canal. 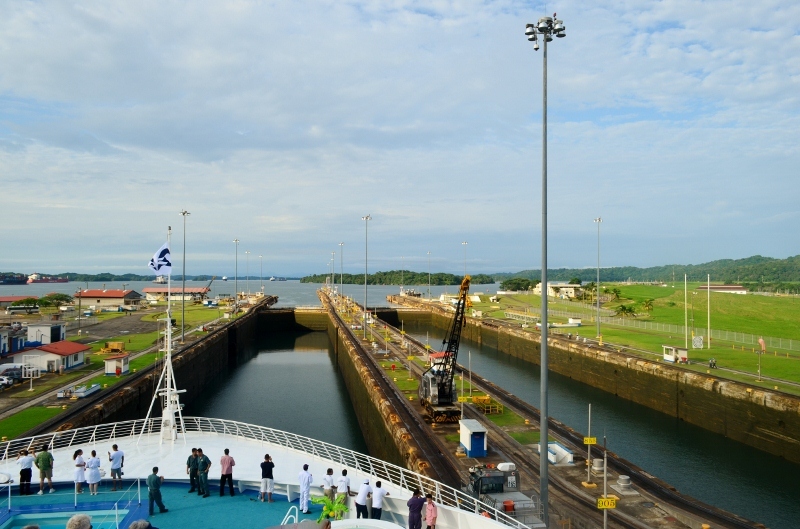 At 5.15am the pilot came onboard and we were pleased to find out that passenger ships get priority, so we had a smooth run right through, although it did take about 9-1/2 hours from the first lock to the Bridge of the Americas. The weather was quite warm at about 30oC, with sunrise at 6.10am and sunset at 6.41pm. We have a television channel with a bridge camera 24/7, but the canal is such an awe-inspiring construction that we spent most of the day outside as we didn’t want to miss anything. At one stage I closed my eyes and nearly went to sleep standing at the ship rail, so it was quite a tiring day but a very interesting one. As we approached the first lock, electric locomotives known as “mules “attached themselves to the ship with steel cables and manoeuvred the ship into a central position whilst the gate closed behind us. 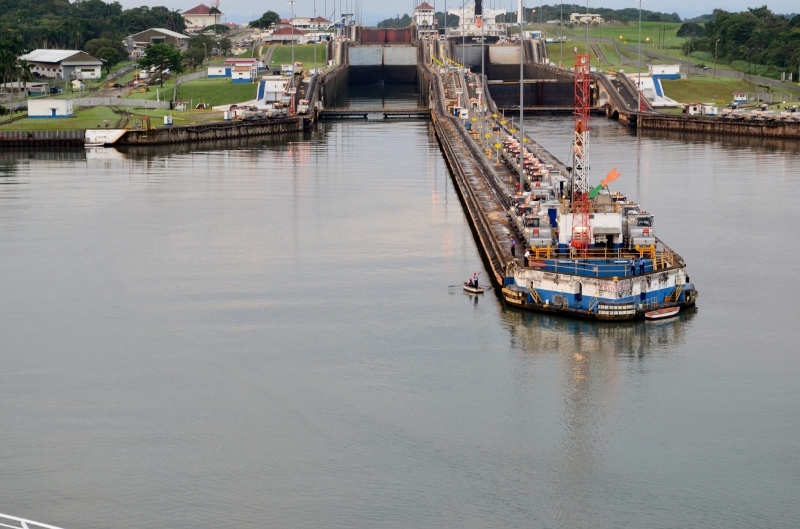 The water used to raise and lower the vessels in each set of locks is obtained from Gatun Lake by gravity and poured into the locks through a main culvert system that extends under the locks chambers from the sidewalls and the centre wall. It seemed only a matter of minutes before the ship was at the correct level then the gates opened, the cables were released and the captain steered the ship to the next lock. 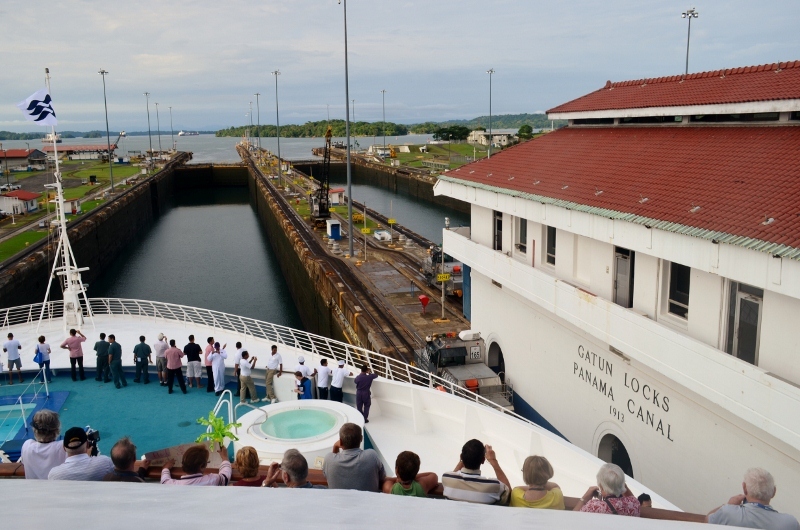 In total there were two lanes, each with two sets of locks; 3 on the approach to bring us up to the level of Gatun Lake, 26 metres above sea level, then two more where the process was reversed to bring the ship down to sea level. 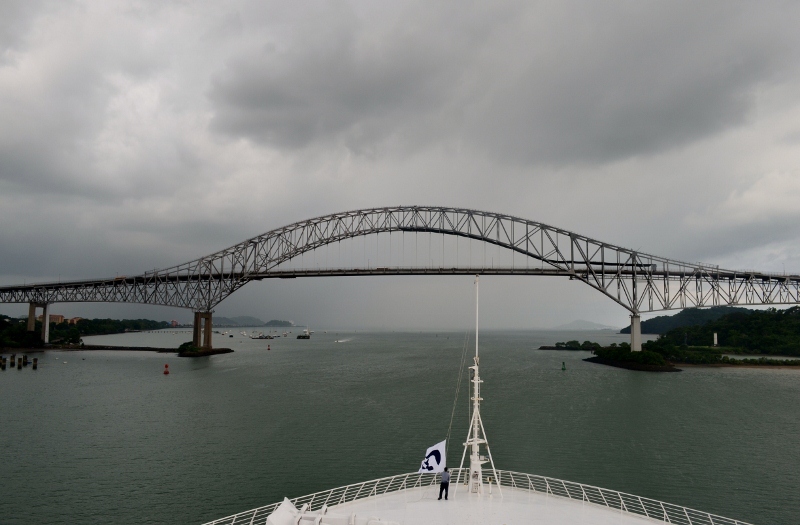 On exiting the canal we passed under the Bridge of the Americas and then our pilot disembarked. 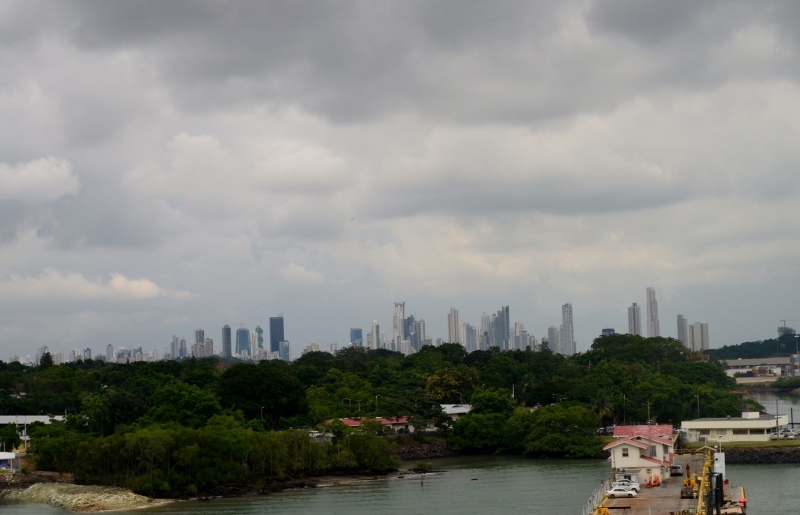 Off to the port side, we glimpsed the white skyscrapers of Panama City in the distance; so near, yet so far! 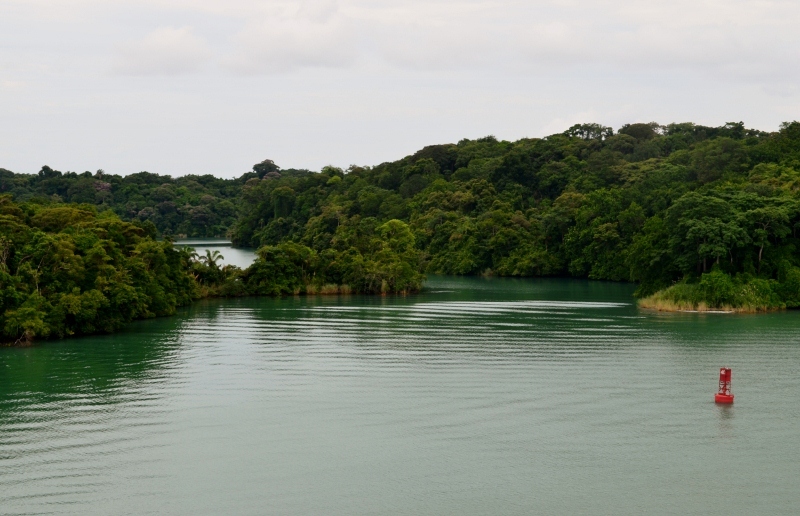 We saw dense tropical forests along the way, and sometimes the land was so close to the ship that we could hear the birds in the trees. 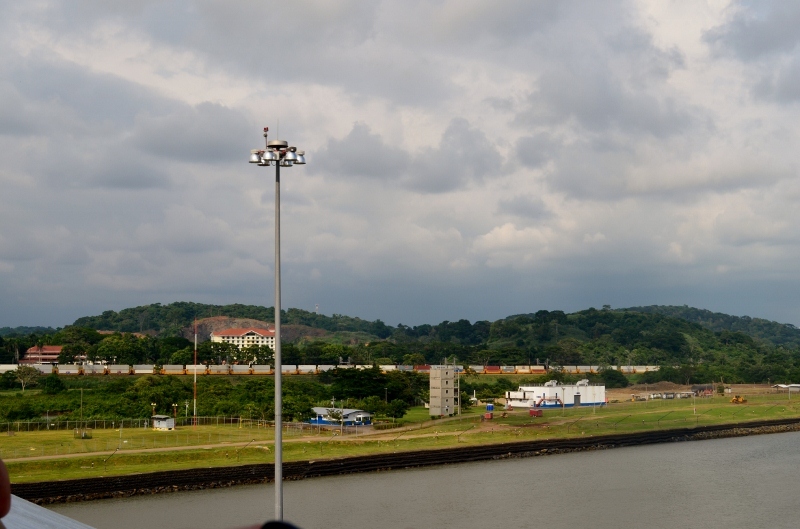 The ship’s lecturer commentated all along the way, giving us many interesting facts about the history of the Panama Canal and also telling us about the monkeys, sloths and birdlife that live in the forests. I saw a small crocodile sunning itself on a bank not far from the ship, and although I managed to get a quick photo, it is hard to see it against the mud bank. I also noticed that the grass had been mown all along the sides of the canal, and found out that it isn’t done just to make it look neat, but rather to discourage snakes from coming too close to the canal. 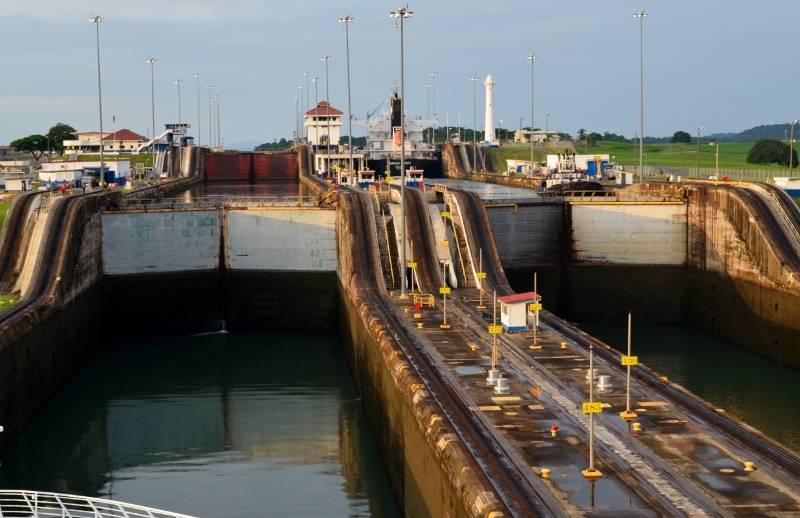 The other interesting thing we noticed was the huge expansion program currently under construction, to add a third lane and a third set of locks which will allow the passage of ships with greater dimensions. 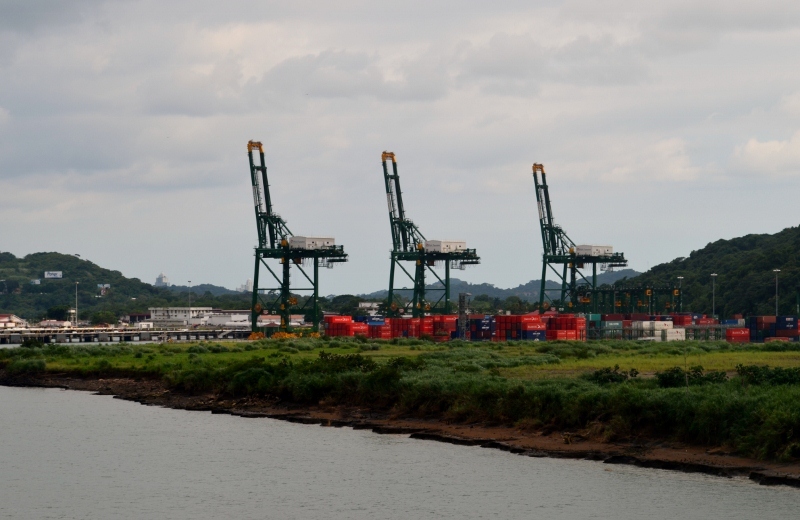 There is a huge container port near the Bridge of the Americas where container ships are loaded from the train which runs parallel to the canal. 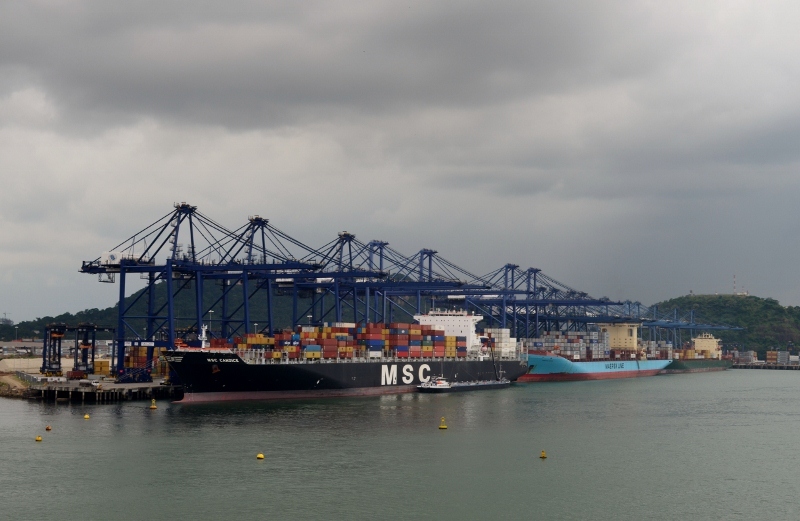 Some of these ships are too heavy to pass through and there is the cost to consider as well, so many of the ships unload their containers onto the train and collect them at the end. 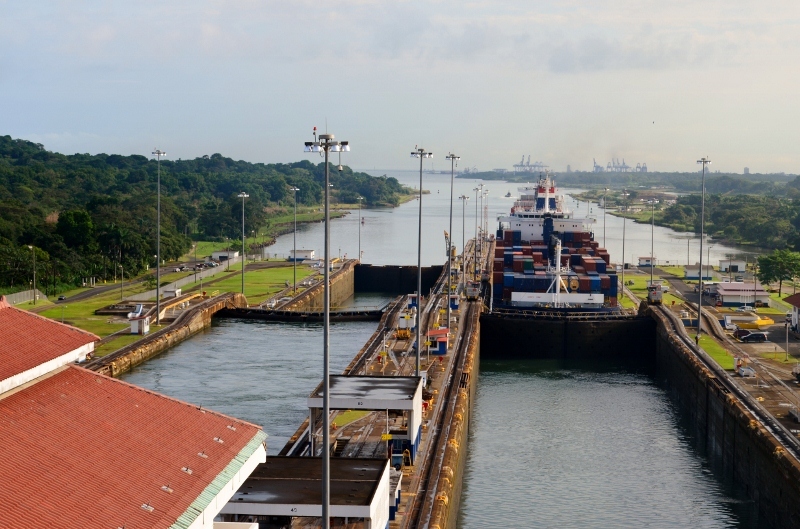 Some interesting facts we learnt about this incredible feat of engineering: The Panama Canal took ten years to construct and was completed in 1914, although the project changed hands several times over the course of 400 years from conception to completion. 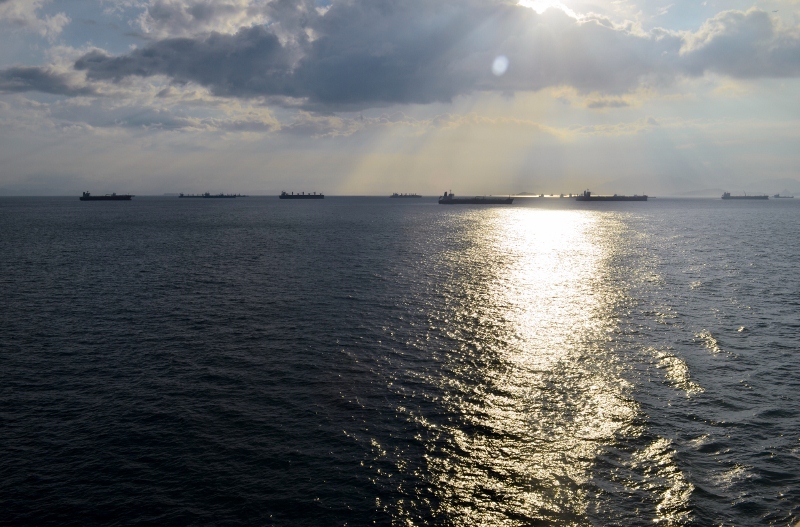 Thousands of workers (up to 50,000 at one time) helped carve through 51 miles of earth and hard granite to link the Caribbean Sea to the Pacific Ocean. The cost to complete was over $350 million and cruise ships today pay over $100,000 to pass through. 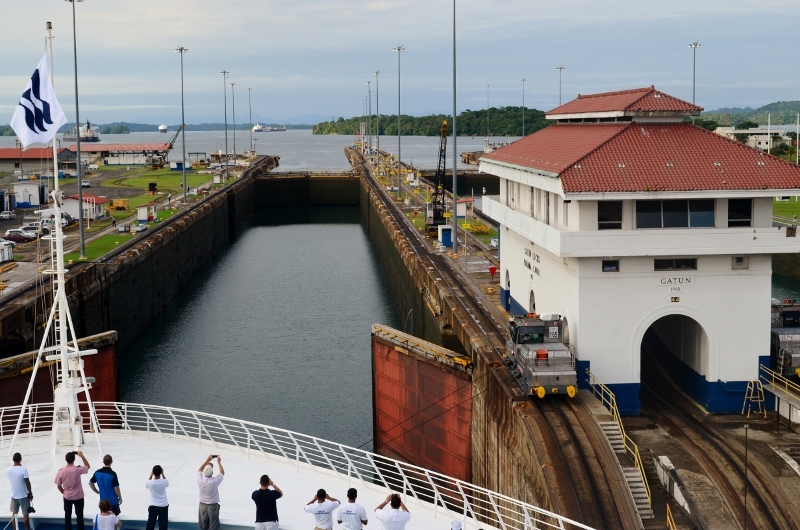 Everyone agreed this was a wonderful experience and I believe that cameras at the locks recorded our passage on the Princess Facebook Page. 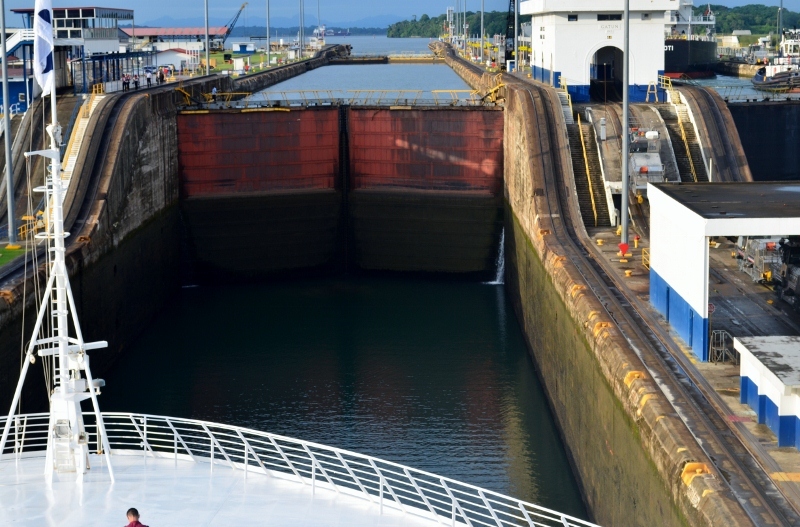 Posted on August 5, 2013 by Jill •	This entry was posted in North America, Travel and tagged Panama Canal, sea princess, travel. Bookmark the permalink.